PepsiCo is a multinational corporation with a woman CEO, awarded for multiculturalism in her company. 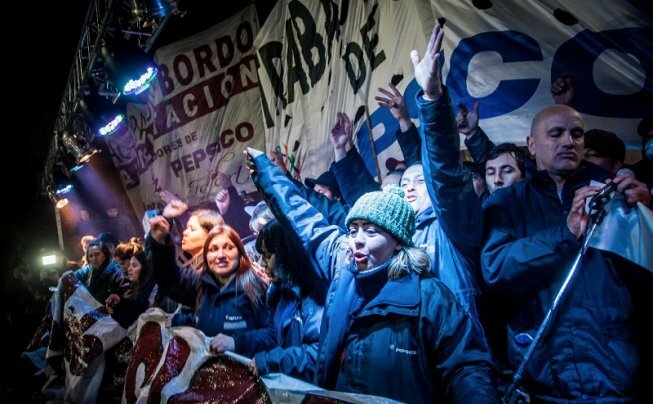 The women in a PepsiCo factory in Argentina are facing off against PepsiCo, demonstrating that individual corporate empowerment means nothing for the exploited. Indra Krishnamurthy Nooyi, an Indian American, is the CEO of PepsiCo, the second largest food and beverage business in the world. It produces products such as Pepsi, Lay’s, Quaker, Dorito, Starbuck’s Ready-to-Drink, 7UP, Cheetos, Aquafina, Mountain Dew, Gatorade and Tropicana. In 2016, it made $62.8 billion in sales, had a market value of $159.4 billion, and employed an estimated 264,000 workers. It is no wonder that as CEO of such an important global corporation, Nooyi was ranked among the world’s most powerful women more than once. Not only has Nooyi been able to achieve the highest levels of business success as an individual, but she opens doors to people of color and women within the corporation. Currently, 27 percent of senior executives at PepsiCo are women and 36 percent are people of color– more diverse than the average corporation without a doubt. In the UK, PepsiCo has been ranked one of the top 50 companies for women to work over six times. The Times and Opportunity Now say that PepsiCo “is leading the way in gender equality in the workplace,” in part due to a Strategies for Success program that helps female middle managers reach senior management positions. For some, Nooyi is a model of female empowerment, evidence that women, and even women of color, can knock down the barriers of racism and sexism to achieve anything they set their minds to. Some may go further to argue that her empowerment is not just an individual achievement because she opens the doors for other women as well, a model feminist. Some would argue that Nooyi’s life demonstrates that the barriers of the past that limited our grandmothers from the highest positions are long gone and that we have entered a new era of equality. Based on this logic, there are still difficulties women face, but women like Nooyi are shining examples that women can overcome these difficulties. This kind of feminism is a meaningless dead end. While Nooyi stands as a beacon of progress, women all over the world suffer from illiteracy, violence, low wages, horrible working conditions. For every Nooyi, there are thousands of women whose bodies and spirits are crushed by the literal and symbolic weight of heavy machinery used to produce the products that make Nooyi a billionaire. Nowhere is this more evident than in the case of PepsiCo in Argentina, a factory where a majority female staff are currently organizing a struggle against layoffs. This struggle highlights the faults of lean-in feminism and exemplifies a different kind of feminism — one that points to a real way forward for women around the world. PepsiCo workers at a rally. Katy not only won her job back, but forced PepsiCo to take measures to save face. They stopped super exploiting subcontracted workers and began to make special donations to charities and to hire people with disabilities etc. Yet the real victories were in the understanding of workers at PepsiCo. “The struggle cost us suspensions, firings and threats, but we would do it again a million times if it changes the consciousness of tons of women who are not willing to resign themselves to the misery of this system,” said Katy. 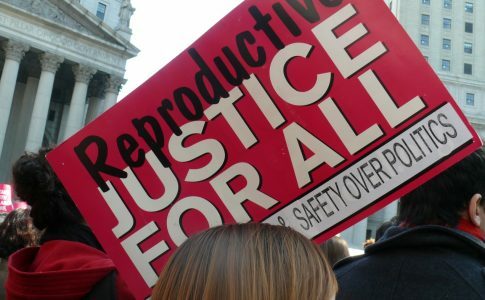 “The abuse, the anger, and the pain taught us to fight and to organize” said Katy. She and other workers, some of whom are members of the Trotskyist Party PTS organized and won leadership of the shop floor committee. As shop floor leaders, they won several concessions: leave for pregnant co-workers, better and safer work conditions and the end of subcontracting. The shop floor committee organizes regular assemblies to vote and decide on actions, promoting internal democracy and participation in the factory. PepsiCo particularly fought for the rights of women workers at PepsiCo and at other factories. For example, in 2010, along with the women’s commission at Kraft Foods, they organized a road blockage, holding a sign that said “Subcontracting and Precarious Work are Violence.” The workers also organized a work stoppage on March 8 for the International Women’s Strike, as well as every June 3 for the Ni Una Menos march. 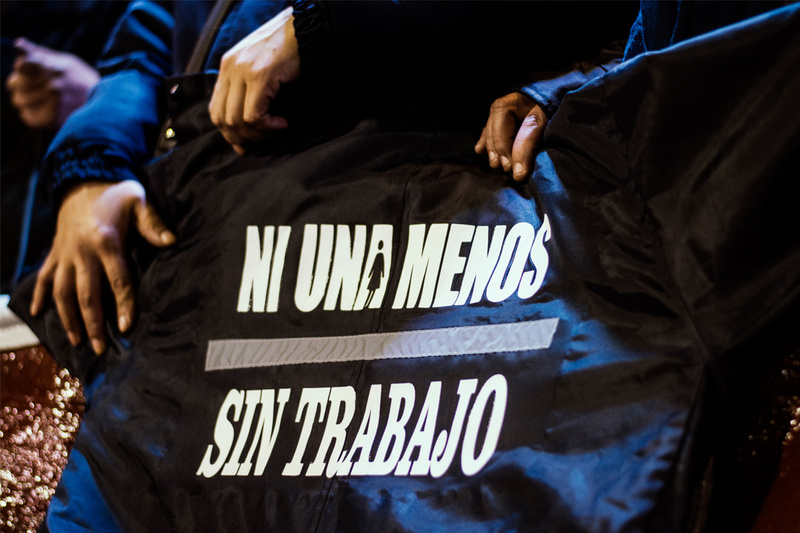 At Tuesday’s massive march for PepsiCo workers, Katy wore a sweater that said “Ni Una Menos Sin Trabajo” — Not one more without work. In the workplace, men and women organize together for women’s rights, as well as for their rights as workers. “We have advanced with unity between male and female workers because we understand that our enemy is the boss who has demonstrated, with a sign on the door, that gender doesn’t matter when it is time to fire us. We decide, we organize ourselves, we have assemblies, we vote (in the assemblies) and fight alongside our male co-workers: not ahead of them, not behind them. 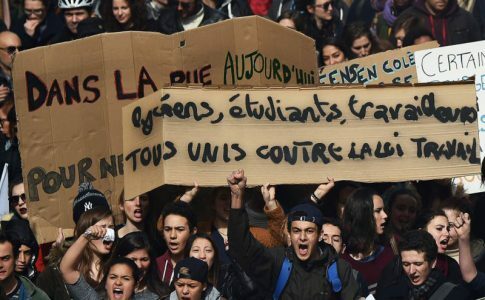 At their side, standing firm for our rights.” Male co-workers who regularly witness the discrimination, humiliation, and violence suffered by women struggle side by side their co-workers against the managers and the bosses. In the midst of an economic crisis, government austerity measures, and a constant increase in layoffs, PepsiCo decided to close the factory in Buenos Aires. The 600 workers arrived at work to find a sign that fired them from the job that they had worked and organized in for years, the factory that many had given their body to, leaving them with aches, pains, and injuries that will never go away. These workers decided to do what they have always done in the factory: fight back. Despite the lack of support from the union bureaucrats, PepsiCo employees voted to occupy the factory, defying the American multinational led by Nooyi. 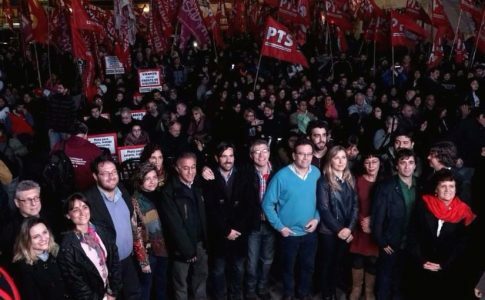 They won over support from the community, engaging in pickets, roadblocks, interviews, solidarity concerts and more, with hundreds of workers, academics, and students expressing solidarity within Argentina and around the world. 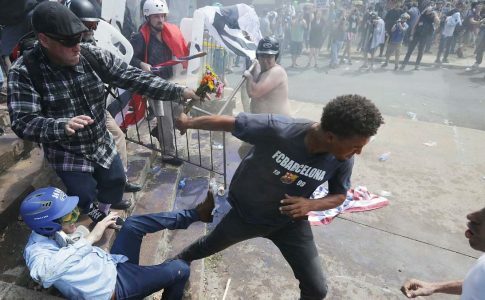 They organized a high profile boycott campaign and movement of international solidarity (including a petition in support that you can sign here). Nobel Peace Prize laureate Adolfo Pérez Esquivel, figures from the Madres de Plaza de Mayo, the massive Ni Una Menos movement, and thousands of activists from human rights, student, and worker organizations have come out in support of PepsiCo workers. In mid July, the PepsiCo workers were violently evicted from their occupation. Armed with tear gas, rubber bullets, and batons, the cops attacked the workers and their supporters. The police attacks on workers and students was broadcast live on TV. 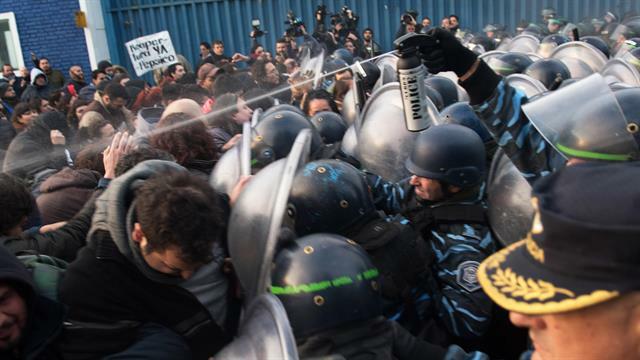 A private consulting firm has estimated that the eviction of PepsiCo was livestreamed, tweeted, and read about by upwards of 20 million people — nearly half the total population of Argentina. Two hours after the eviction and with media attention and public pressure mounting, a Labor Court of Appeals ruled in favor of the workers and ordered the company to reinstate them. However, PepsiCo has yet to comply with the court’s decision. The workers continue their struggle, even without the factory occupation. 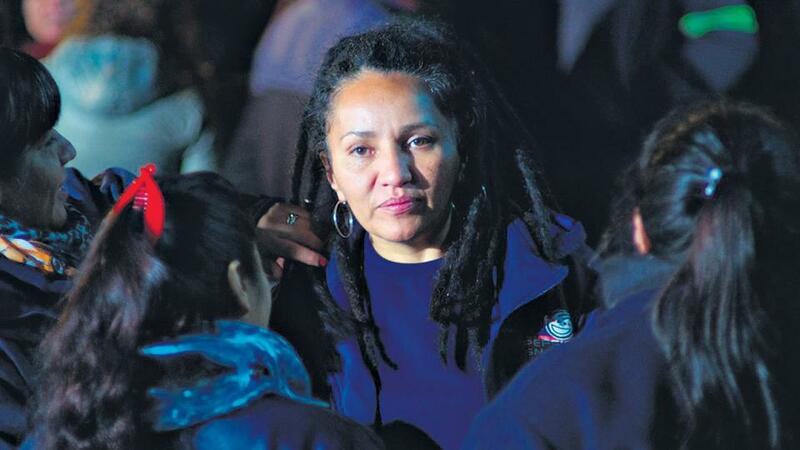 On July 18, 30,000 people marched to the National Congress representing combative union locals, student organizations, human rights activists, and the globally known #NiUnaMenos feminist collective. The hashtag #TodosConPepsicoEnLucha (Everyone With Pepsico in Struggle) was a trending topic for six hours. The workers set up a tent to coordinate the struggle against PepsiCo, as well as against austerity and layoffs. The women of Pepsico demonstrates that women in the highest positions of society, whether they be in the government or in corporations, do not mean the liberation of working women; Nooyi of PepsiCo may be a woman of color, but that didn’t make the conditions at PepsiCo any less exploitative. Changing the gender of those in power is merely a symbolic gesture, with no material consequences for the vast majority of women. Nooyi’s position as the CEO of PepsiCo, her super salary of $25,168,597, and the super salaries of all the women and people of color she seeks to put in management positions are built on the broken backs of Katy and workers like her around the world. Nooyi is wealthy because Katy is overworked and underpaid; Nooyi keeps her position as CEO by guaranteeing profits for shareholders, profits made by the labor of Katy and her co-workers. The longer Katy works, the lower her wages, the more precarious her job, the more PepsiCo makes a profit and the more Nooyi is a “good” CEO. When Forbes ranked PepsiCo one of the best places for women employees, did they take into account the hundreds of thousands of women around the world like Katy who break their backs and spend their lives as the human extensions of machines? Just last year, Hillary Clinton tried to convince American women that she was a symbol of female empowerment and that a Clinton Presidency was a victory for all women. It’s the empowerment represented by the CEO of PepsiCo and the governor of Buenos Aires. It’s empowerment that means nothing to the women workers of PepsiCo, to the partners of male workers, and to the women all over the world who are oppressed and exploited by “empowered women”. Yet, the PepsiCo struggle also highlights a different kind of feminism, a feminism rooted in the working class, in combativeness, and in refusing to accept symbolic gestures of equality. It is a feminism that understands that working women’s enemies are the bosses, whether male or female, and their allies are their male co-workers who labor in the same working conditions as women PepsiCo workers. Today, there are more women than ever in history in the labor market. This can be a source of tremendous strength, as working class women organize themselves against labor abuses and sexism. 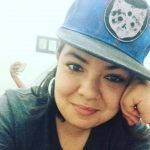 PepsiCo workers show a different kind of feminism, a feminism rooted in working class solidarity. A feminism that defends the working class and women against all violence by individual men, the capitalists, and the government. A feminism that does not seek individual empowerment but the empowerment of the working class as a class in defense of their rights and the rights of all oppressed people in society. A kind of feminism that understands that an injury to one is an injury to all; while one of us is oppressed and exploited, all of us are in chains. The kind of feminism that organizes in shop floor committees along with male co-workers for the rights of pregnant workers and for safer conditions for everyone. While some argue that this kind of feminism is marginal, idealistic, impossible to take hold, I argue that this is the only kind of feminism that can realistically win rights for women — all women. This is the kind of feminism that wants actual victories, not symbolic ones, a feminism that wants to win the world for the working class and oppressed, not just crumbs for a lucky few.